Willow Gardens care home in Yately have celebrated National Poetry Day on Thursday 4 October 2018. A special guest speaker, Mr Andrew Sheldon a local retired teacher, came to the home and read residents some of his favourite poems to mark the special day. 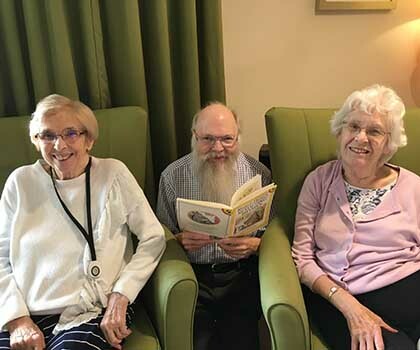 Suzanne Steed, Customer Relations Manager at Willow Gardens said: "Everyone has had a lovely day, while Mr Sheldon was reading for us we all listened, laughed, and enjoyed a glass of sherry. He read lots of Roald Dahl, Brian Moses and Roger McGough - all with a humorous touch! For more information about Willow Gardens call 01252 864 700.